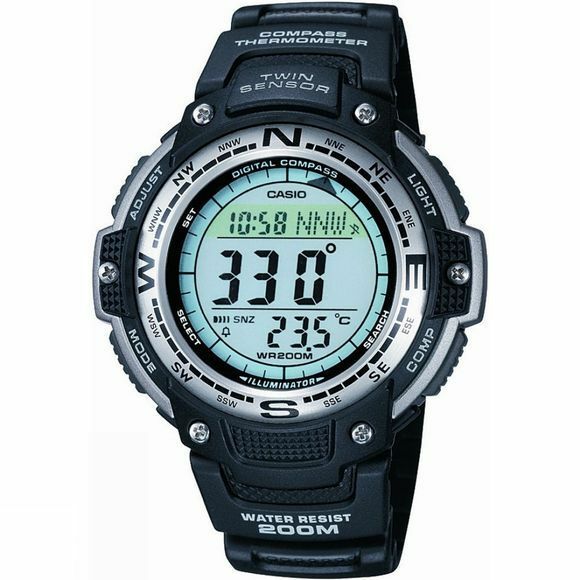 If you are looking for a durable watch with a range of sports features the Sports Watch SGW-100-1VEF is an ideal choice. It's housed in resin with a stainless steel case and scratch resistant mineral glass, making the watch water resistant to two-hundred metres. You'll never be late either as a seamless World Time Function keeps you in synch with global time, and if it's dark simply tilt the watch towards you and an LED will automatically illuminate the watch face. A stopwatch keeps a measure of time thanks to the easy press buttons, while a countdown timer allows you to set your own training on the go. The watch has further features to makes your life easier; the digital compass has a built-in direction sensor to detect magnetic north. Also a thermometre gives you a temperature reading, and an easy to set alarm function has been added to make sure you never miss an appointment.